Where was Florida’s notoriously trigger happy cops to take down thug Mark Allen Bartlett. 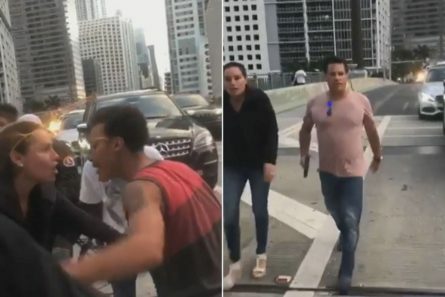 AFRICANGLOBE – A white male was caught on video confronting a group of Black teens while he was holding a gun and repeatedly shouting the n-word. The male, later identified as Mark Allen Bartlett, was arrested and charged with carrying a concealed weapon without a license. On January 21st, Martin Luther King Jr. Day, a white woman was caught on video shouting at Black teens who were participating in a “Wheels Up, Guns Down” demonstration and protesting the redevelopment of a public housing complex while riding their bicycles. She apparently wanted the teens to get out the way as she alleged they were blocking the bridge. Another video captured by Florida activist movement, shows the woman, later identified as Dana Scalione, yelling “don’t touch me,” and a teen replied that he never touched her. She also claimed that someone ran over her foot with a bicycle and shoved the teen, although it was later found out that the bicycle stopped before actually hitting her foot. A few seconds later during that confrontation, her boyfriend, 51-year old Mark Allen Bartlett, got out of his car brandishing his gun towards the teens and called them “d*mb-a*s f*cking n*ggers,” as seen on the video. The video ended as Scalione and Bartlett were walking away still shouting expletives and racist insults. Bartlett was arrested on charges of illegally brandishing a gun and carrying a concealed weapon without a license on Monday. More serious charges of hate crime are expected to be imposed. Meanwhile, Scalione was fired from her real estate job at Insignia International Properties. Next articleWhat Options Are Available For Sudan’s Al Bashir?